Homepage. 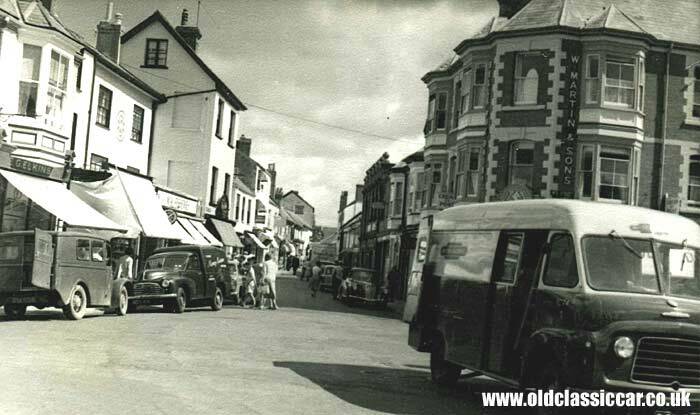 This page: A variety of classic commercials seen in this view of Old Fore St in Sidmouth. A walk-thru Commer van in Sidmouth. Nearest the camera is a Commer walk-thru delivery van, in the colours of British Railways, vehicle fleet number IC 74. The lower section of the bodywork would be finished in maroon, and the upper part in cream. It is seen driving away from Old Fore Street, one of the main roads in the town of Sidmouth. These medium-sized commercial vehicles were introduced at the beginning of the 1960s, which gives a good clue as to when this picture was taken. A look online brought up a view of this area as it is now, and very few of the buildings have changed much at all in the intervening 40+ years since this photograph was taken. Perhaps the biggest change is that this is now a pedestrianised area. The white building on the left, with the two blanked off windows, has seen some work and the windows have now been re-instated. Parked on the left is an unidentified van (with windows added to the sides), presumably delivering to one of the local shops - perhaps to E.G. Elkins? A young tree is now planted in this spot. Just in front of this small commercial (reg. DYA 538) is another interesting vehicle, in the shape of a 1950-1956 Morris Cowley MCV delivery van, similar in appearance to the MO Oxford saloon albeit with a fully separate chassis, as with the Minor light commercials. Behind this signwritten Morris, is a Ford 100E, parked outside Mac Fisheries. A number of other cars and vans can just be made out further along Old Fore Street, although the only one that can clearly be seen is a 1950s Wolseley, probably a 4/44.